Enrollment: Pre-K through 12th grade. 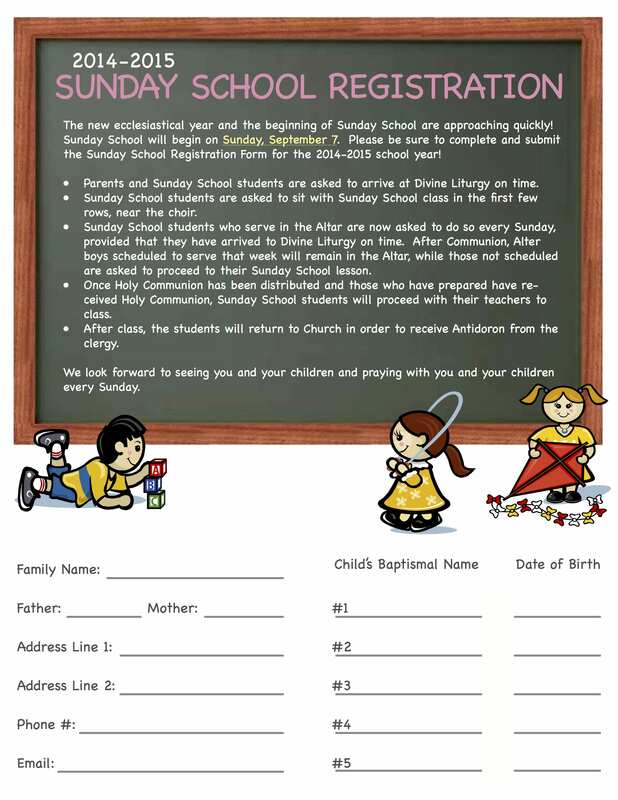 Academic Year: Classes are held on Sunday immediately following the distribution of Communion. Registration opens on our Church Family Day (typically the first Sunday in September). Rolling registration throughout the academic year. Sunday School Students are encouraged to arrive at Divine Liturgy on time, to sit with their teachers and classmates in the designated pews. A youth sermon is offered following the reading of the Gospel. Occasionally, students have the opportunity participate in Liturgical processions, i.e. on the Sunday of Orthodoxy, the Sunday of the Veneration of the Cross, and Palm Sunday. On days such as these, students and their families will be notified and Sunday School will begin at 10:00 AM rather than after communion. Faculty and staff will meet monthly to improve teaching skills and learn new ideas to share with their students. Registration begins and continues throughout the month of September. Purpose: To cultivate within our children the Orthodox way of life. Activities: Each class has special projects and curriculum; however, all students participate in activities during the year (Christmas Pageant, Godparent/Godchild Sundays, Youth Sundays, etc.). Enrollment: Kindergarten through 12th grade. Academic Session: Classes commence on the first Sunday after the annual Hamptons Greek Festival and continue for approximately one month until the last Sunday before the Feastday of our Church, the Kimisis Tis Theotokou (August 15). Class Time: All young people are invited to participate immediately following the offering of Holy Communion until the beginning of the Agape Fellowship Hour. Purpose: To reach out, serve our youth during the summer season, and cultivate within our young people the Orthodox Christian way of life. Participation: Open to those interested in exploring Orthodox Christianity, and required for those preparing to convert to Orthodoxy by Baptism or Chrismation. 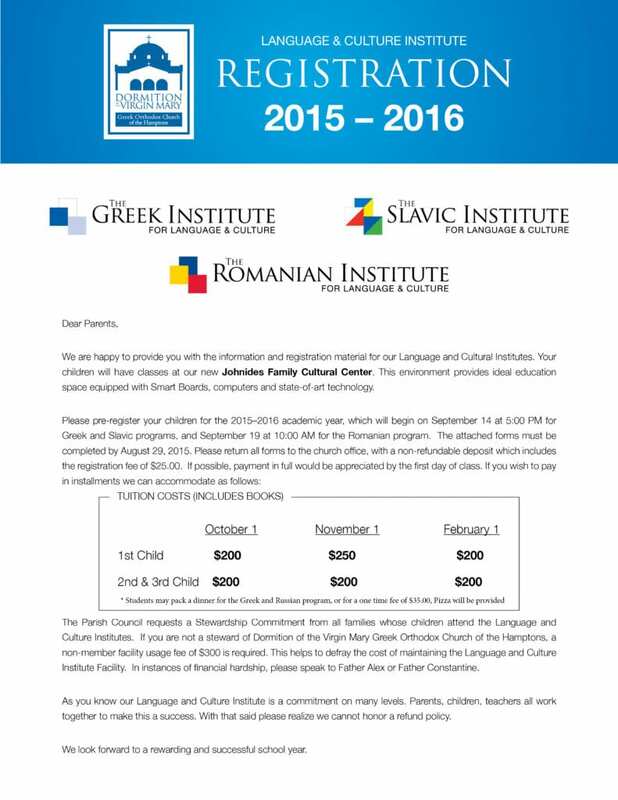 The Language and Culture Institute of the Hamptons currently offers three tracts of language and cultural instruction: Greek, Romanian and Slavic. The Language and Culture Institute aims to strengthen the Orthodox Christian Faith and cultural identity of its students by offering language instruction, as well as exposure to the literary, musical, artistic and folk dance traditions of the respective cutlures. All of the students of the Institute share in common projects, and performances, emphasizing that they are part of the same Church Family, and find unity and commonality in their Orthodox Faith and the Universal Hellenic underpinnings of the various cultures they study. We envision our Language and Culture Institute as a paradigm for the Greek Orthdox Parish in a multicultural setting, and environment in which multiple cultural traditions are celebrated, In the loving embrace of the Greek Orthodox Church. Enrollment: pre-k through high school. Academic Year: Classes for the 2018/19 year begin in September and registration is currently open! For details and registration, down load this file.